2 - 3 $51.84 ea. Procell batteries by Duracell are rugged and long lasting, and the perfect choice for powering vital workplace electronics. On a job site or in an office, Procell AA batteries offer not only high quality construction but a massive capacity that will keep your devices running longer than competing batteries. This hearty case of 144 batteries contains (6) 24-piece cartons (each with (6) 4-piece packs inside) that can easily be organized and distributed through a work force. Alternatively these batteries can be stored for an extended period of time due to a remarkable 7 Year Shelf Life. 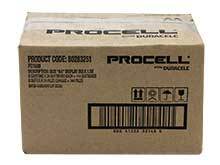 Duracell Procell AA batteries are the leading name in industrial quality batteries as well as a reliable and economic choice. Please feel free to browse our Packaging Guide for a better understanding of how these batteries are sold. When placing an order, 1 unit purchased is equal to a box of 144 cells. The case of 144 is divided up into 6 medium-sized boxes of 24 cells. We also sell the box of 24 on its own, if preferred. Within each box of 24 are smaller boxes of 4 batteries. All of the PC1500 batteries feature the same wrapper and expiration date. These batteries are also sold individually, if preferred. Batteries we needed at a great price and received sooner than expected! Will keep this company in mind for the future! are the batteries boxed in 4-packs? As Low As: $1.08 Ea. As Low As: $1.60 Ea.